Sen, Amartya (1980), "Equality of what? (lecture delivered at Stanford University, 22 May 1979)", in MacMurrin, Sterling M. (ed. ), The Tanner lectures on human values, 1 (1st ed. ), Salt Lake City, Utah: University of Utah Press, ISBN 9780874801781. Reprinted as: Sen, Amartya (2010), "Equality of what? ", in MacMurrin, Sterling M. (ed. ), The Tanner lectures on human values, 4 (2nd ed. ), Cambridge: Cambridge University Press, pp. 195–220, ISBN 9780521176415. Sen, Amartya (1988), "The concept of development", in Srinivasan, T.N. ; Chenery, Hollis (eds. ), Handbook of development economics, 1, Amsterdam New York New York, N.Y., U.S.A: North-Holland Sole distributors for the U.S.A. and Canada, Elsevier Science Publishing Co., pp. 2–23, ISBN 9780444703378. Sen, Amartya (2004), "Capability and well-being", in Nussbaum, Martha; Sen, Amartya (eds. ), The quality of life, New York: Routledge, pp. 30–53, ISBN 9780415934411. Sen, Amartya (2004), "Development as capability expansion", in Kumar, A. K. Shiva; Fukuda-Parr, Sakiko (eds. ), Readings in human development: concepts, measures and policies for a development paradigm, New Delhi New York: Oxford University Press, ISBN 9780195670523. Reprinted in Sen, Amartya (2012), "Development as capability expansion", in Saegert, Susan; DeFilippis, James (eds. ), The community development reader, New York: Routledge, ISBN 9780415507769. Sen, Amartya (2008), ""Justice" - definition", in Durlauf, Steven N.; Blume, Lawrence E. (eds. ), The new Palgrave dictionary of economics (8 volume set) (2nd ed. ), Basingstoke, Hampshire New York: Palgrave Macmillan, ISBN 9780333786765. See also: The New Palgrave Dictionary of Economics. Sen, Amartya (2008), ""Social choice" - definition", in Durlauf, Steven N.; Blume, Lawrence E. (eds. ), The new Palgrave dictionary of economics (8 volume set) (2nd ed. ), Basingstoke, Hampshire New York: Palgrave Macmillan, ISBN 9780333786765. See also: The New Palgrave Dictionary of Economics. Sen, Amartya (January – February 1970). "The impossibility of a paretian liberal" (PDF). Journal of Political Economy. 78 (1): 152–157. doi:10.1086/259614. JSTOR 1829633. ^ "Indian Nobel laureate Amartya Sen honoured in US". BBC News. 14 February 2012. Retrieved 5 March 2017. ^ "Listeners name 'greatest Bengali'". 14 April 2004. Retrieved 19 August 2018. ^ "The Hindu : International : Mujib, Tagore, Bose among 'greatest Bengalis of all time'". The Hindu. Retrieved 19 August 2018. ^ "The Daily Star Web Edition Vol. 4 Num 313". The Daily Star. Retrieved 19 August 2018. ^ "Amartya Sen - Biographical". Nobel Foundation. Retrieved 25 April 2016. ^ Riz Khan interviewing Amartya Sen (21 August 2010). One on One - Amartya Sen (Television production). Al Jazeera English. Event occurs at 18:40 minutes in. Retrieved 26 April 2016. ^ "Amartya Sen - Biographical". Nobel Foundation. Retrieved 20 November 2017. ^ Sen, Amartya (2010), "Equality of what? ", in MacMurrin, Sterling M. (ed. ), The Tanner lectures on human values, 4 (2nd ed. ), Cambridge: Cambridge University Press, pp. 195–220, ISBN 978-0521176415. Pdf version. ^ "Amartya Sen | Indian economist". Encyclopædia Britannica. Retrieved 26 April 2016. ^ "WHO | Amartya Sen". www.who.int. Retrieved 29 December 2017. ^ Steele, Jonathan (31 March 2001). "The Guardian Profile: Amartya Sen". The Guardian. ISSN 0261-3077. Retrieved 29 December 2017. ^ "St Edmund's College - University of Cambridge". st-edmunds.cam.ac.uk. Retrieved 10 September 2018. ^ Bardhan, Pranab (July – August 2006). "The arguing Indian". California Magazine. Cal Alumni Association UC Berkeley. Retrieved 16 June 2014. ^ "Economist Amartya Sen awarded Bodley Medal". Bodleian Libraries. Retrieved 28 March 2019. Antara Dev Sen (born 1963) is a British–Indian journalist. The Chicago Boys were a group of Chilean economists prominent around the 1970s and 1980s, the majority of whom trained at the Department of Economics of the University of Chicago under Milton Friedman and Arnold Harberger, or at its affiliate in the economics department at the Pontifical Catholic University of Chile. Upon their return to Latin America they adopted positions in numerous South American governments including the Military dictatorship of Chile (1973–90). As economic advisors, many of them reached high positions within those. The Heritage Foundation credits them with transforming Chile into Latin America's best performing economy and one of the world's most business-friendly jurisdictions. However, critics point to drastic increases in unemployment that can be attributed to policies implemented on their advice to fight inflation. Some (such as Nobel laureate Amartya Sen) have argued that these policies were deliberately intended to serve the interests of American corporations at the expense of Latin American populations. Peter Kornbluh states that in the case of Chile, American attempts to destabilize the Chilean economy ceased once the Chicago Boys had gained political influence; this may have been the true underlying cause of the subsequent increase in economic growth. Development as Freedom is a 1999 book about international development by the economist Amartya Sen. Equality of autonomy is a political philosophy concept of Amartya Sen that argues "that the ability and means to choose our life course should be spread as equally as possible across society"—i.e., an equal chance at autonomy or empowerment. Equality of autonomy strives to spread empowerment widely so that "given their circumstances", people have more "choice and control". The concept has a slightly different emphasis from related notions, such as the value of equality in the workplace ("equal opportunity") or equal material wealth ("equality of outcome"). According to Todd May, Sen's approach requires "active intervention of institutions like the state into people's lives" but with an aim towards "fostering of people's self-creation rather than their living conditions". Sen argued that "the ability to convert incomes into opportunities is affected by a multiplicity of individual and social differences that mean some people will need more than others to achieve the same range of capabilities". Inequality Reexamined is a 1992 book by Amartya Sen. In the book Sen evaluates the different perspectives of the general notion of inequality, focusing mainly on his well-known capability approach. The author argues that inequality is a central notion to every social theory that has stood on time. For only if this basic feature is satisfied can a social theory which advocates a set of social arrangements be plausible. Taken the inequality ingredient for granted, the crucial question becomes: inequality of what? Sen answers this basic question by advocating his preferred notion of equality which is based on the capability for Functions. A set of high material quality-of-life indicators coinciding with moderate per-capita incomes, both distributed across nearly the entire population of Kerala. A set of wealth and resource redistribution programmes that have largely brought about the high material quality-of-life indicators. High levels of political participation and activism among ordinary people along with substantial numbers of dedicated leaders at all levels. Kerala's mass activism and committed cadre were able to function within a largely democratic structure, which their activism has served to reinforce. Kshitimohan Sen (2 December 1880 – 12 March 1960) was an Indian scholar, writer and a Sanskrit professor. He was an acting Upacharyas of Visva-Bharati University (1953–1954). He is the maternal grandfather of Amartya Sen.
Landesque capital is a widespread concept used to understand anthropogenic landscapes that serve important economic, social, and ritual purposes. Liberalisme: Politisk frihet fra John Locke til Amartya Sen (English: Liberalism: Political Freedom from John Locke to Amartya Sen) is a 2009 Norwegian language anthology edited by Lars Svendsen. The book focuses on the history of liberalism and libertarianism in general, and contains a sample of liberal thinkers from John Locke to Amartya Sen. It was published by Universitetsforlaget with financial support from Civita and Fritt Ord. The book received mixed reviews by critics. A list of Nobel laureates affiliated with the London School of Economics. By official figures 18 Nobel Prizes in economics, peace and literature have been awarded to LSE alumni and staff. By 2016, 27% (or 13 out of 48) of all the Nobel Prizes in Economics have been awarded or jointly awarded to LSE alumni, current staff or former staff, making up 17% (13 out of 78) of all laureates. LSE alumni and staff have also won 3 Nobel Peace Prizes, and 2 Nobel Prizes in Literature. Individual contributors to classical liberalism and political liberalism are associated with philosophers of the Enlightenment. Liberalism as a specifically named ideology begins in the late 18th century as a movement towards self-government and away from aristocracy. It included the ideas of self-determination, the primacy of the individual and the nation, as opposed to the state and religion, as being the fundamental units of law, politics and economy. Since then liberalism has broadened to include a wide range of approaches from Americans Ronald Dworkin, Richard Rorty, John Rawls and Francis Fukuyama as well as the Indian Amartya Sen and the Peruvian Hernando de Soto. Some of these people moved away from liberalism, while others espoused other ideologies before turning to liberalism. There are many different views of what constitutes liberalism, and some liberals would feel that some of the people on this list were not true liberals. It is intended to be suggestive rather than exhaustive. Theorists whose ideas were mainly typical for one country should be listed in that country's section of liberalism worldwide. Generally only thinkers are listed, politicians are only listed when they, beside their active political work, also made substantial contributions to liberal theory. Mahbub ul Haq (Urdu: محبوب الحق‎; 24 February 1934 – 16 July 1998) was a Pakistani game theorist, economist and an international development theorist who served as the 13th Finance Minister of Pakistan from 10 April 1985 until 28 January 1988.After studying economics at Punjab University, he travelled to Cambridge where he got a degree. He later moved to Yale where he received his PhD and later worked as a postdoctoral researcher at the Harvard Kennedy School. He returned to Pakistan to serve as the Chief economist of Pakistan during the 1960s, and moved to the U.S after the election of the socialist government led by Zulfikar Ali Bhutto. At the World Bank he worked as the policy director throughout the 1970s and also the chief economic adviser to Robert McNamara.He moved back to Pakistan in 1982 and in 1985 became the country's Finance Minister and oversaw a period of cautious economic liberalisation. In 1988 he moved back to U.S where he served as the Special Adviser to the UNDP Administrator William Henry Draper. Here, Haq led the establishment of Human Development Report which includes the now popular HDI, which measures development by people's well-being, rather than by their income alone. He returned to Pakistan in 1996 to establish the Human Development Center in Islamabad.Haq is considered to have had a profound effect on global development. 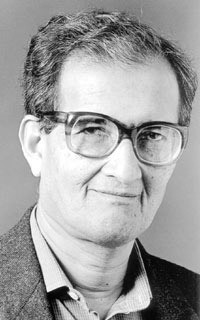 Haq's 1996 book Reflections on Human Development is said to have opened new avenues to policy proposals for human development paradigms, such as the 20:20 Global Compact and the setting up the UN Economic and Social Council.Amartya Sen and Tam Dalyell termed Haq's work to have "brought about a major change in the understanding and statistical accounting of the process of development." The Economist called him "one of the visionaries of international development." He is widely regarded as "the most articulate and persuasive spokesman for the developing world". Nabaneeta Dev Sen (Nôbonita Deb Sen) (born 13 January 1938), Padma Shri (2000) is an award-winning Indian poet, novelist and academic. Nalanda University (also known as Nalanda International University) is an international and research-intensive university located in Rajgir, near Nalanda, India, which was established by an Act of Parliament to emulate the famous Nalanda of ancient India. The original university, widely considered to be the greatest of all ancient monasteries and the world's first residential institution, functioned for over 800 years from around 400 AD, long before University of Oxford, University of Cambridge or Harvard University came into existence. Nalanda University at its peak housed 10,000 students from all across Asia. Some famous personalities associated with the original university include Lord Buddha, who preached at Rajgir centuries earlier, and the legendary Buddhist master Atiśa. The university began its first academic session on September 1, 2014 with 15 students including five women. Its original faculty consisted of world-class professors from some of the top universities across the globe. Initially set up with temporary facilities in Rajgir, a massive modern campus is expected to be finished by 2020. The university has been designated as an "international university of national importance" by the Parliament of India. Nalanda is exclusively a graduate school, currently only offering Master's courses, with PhD programmes to be offered in future. Normative economics (as opposed to positive economics) is a part of economics that expresses value or normative judgments about economic fairness or what the outcome of the economy or goals of public policy ought to be.Economists commonly prefer to distinguish normative economics ("what ought to be" in economic matters) from positive economics ("what is"). Many normative (value) judgments, however, are held conditionally, to be given up if facts or knowledge of facts changes, so that a change of values may be purely scientific. On the other hand, welfare economist Amartya Sen distinguishes basic (normative) judgments, which do not depend on such knowledge, from nonbasic judgments, which do. He finds it interesting to note that "no judgments are demonstrably basic" while some value judgments may be shown to be nonbasic. This leaves open the possibility of fruitful scientific discussion of value judgments.Positive and normative economics are often synthesized in the style of practical idealism. In this discipline, sometimes called the "art of economics," positive economics is utilized as a practical tool for achieving normative objectives. The price of milk should be $6 a gallon to give dairy farmers a higher living standard and to save the family farm.This is a normative statement, because it reflects value judgments. This specific statement makes the judgment that farmers deserve a higher living standard and that family farms ought to be saved.Subfields of normative economics include social choice theory, cooperative game theory, and mechanism design. Some earlier technical problems posed in welfare economics and the theory of justice have been sufficiently addressed as to leave room for consideration of proposals in applied fields such as resource allocation, public policy, social indicators, and inequality and poverty measurement. The Argumentative Indian is a book written by Nobel Prize winning Indian economist Amartya Sen. It is a collection of essays that discuss India's history and identity, focusing on the traditions of public debate and intellectual pluralism. Martha Nussbaum says the book "demonstrates the importance of public debate in Indian traditions generally. "The Argumentative Indian has brought together a selection of writings from Sen that outline the need to understand contemporary India in the light of its long argumentative tradition. The understanding and use of this argumentative tradition are critically important, Sen argues, for the success of India's democracy, the defence of its secular politics, the removal of inequalities related to class, caste, gender and community, and the pursuit of sub-continental peace. The Idea of Justice is a 2009 book by the economist Amartya Sen. The work is a critique and revision of John Rawls's ideas in A Theory of Justice (1971).